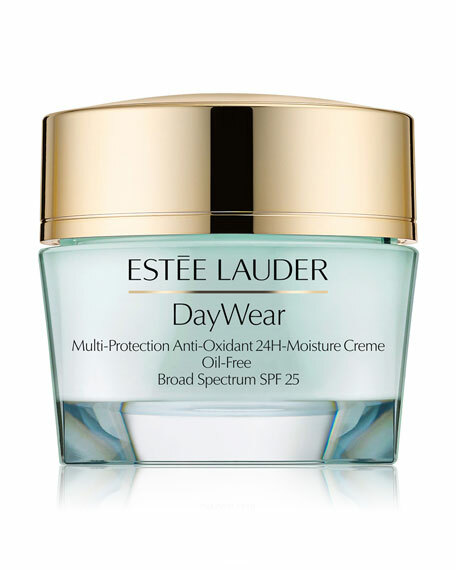 Estee Lauder DayWear Advanced Multi-Protection Anti-Oxidant Cème Oil-Free SPF 25, 1.7 oz. Estee LauderDayWear Advanced Multi-Protection Anti-Oxidant Cème Oil-Free SPF 25, 1.7 oz. This high-performance, oil-free moisturizer defends against signs of premature agingand diminishes their appearance. So hydrating, it infuses skin with an intense surge of moisture that lasts24 hours. DayWear includes sunscreen. It reduces the first signs of aging, like dullness and fine, dry lines. This fresh, oil-free Creme SPF 25 helps control surface oil.